"Pamela Jean Gately, Westbrook College, Class of 1978"
Westbrook College student Pamela Jean Gately, Class of 1978, was a Dental Hygiene major and lived in McDougall Hall. 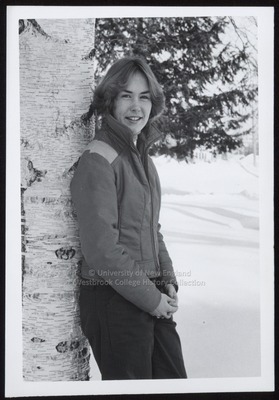 For her senior class candid photo, which appeared in the 1978 Tower Yearbook, she wore dark pants and a zippered ski jacket with light colored epaulets. Her light hair was chin length, parted in the middle and feathered back on the sides. Pamela leans against a white birch tree trunk surrounded by snow. Her hands are softly folded.